This lamb stew is inspired by a recipe in The Palestinian Table by Reem Kassis. 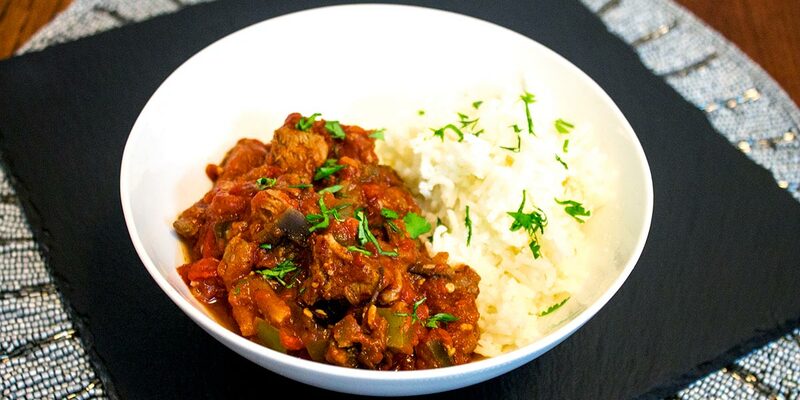 Spiced lamb with aubergine, green bell peppers and garlic in a rich and flavourful tomato sauce that is really simple to make and very satisfying. I bought this recipe book a couple of months ago, along with a Persian and a Moroccan one also. I just decided I really wanted to explore those flavours and cuisines. Spiced lamb in tomato sauce topped with a little chopped parsley for garnish. This is a lovely book. The spiced lamb dish above is the first recipe I’ve tried and it’s the inspiration for this stew. It’s so easy and good! The author tells us of her food and cooking experiences that led her to write the book. She recounts small details of her life growing up in Jerusalem, of the culture as it relates to meals and how they make them. Not too much detail, just enough to a give you a picture of a place full of sights, sounds and spicy smells, a place of life and culture and traditions. It’s good to remember how much more there is to the different cultures there than the conflict between them. I’m just going to say this straight out – I want to show solidarity with Palestine over the Trump administration’s attempt to ignore Palestinians equal claim to the city of Jerusalem. Israel, I’m not going to criticise you, partly because of the awful history of anti-semitism throughout Europe over … centuries (it’s shameful), also because I don’t know enough, and also because there are plenty of Israelis who do criticise the occupation of Palestinian Territory – listen to them – please. I’m sorry to bring that up because the beauty of this book is that it is simply sharing some lovely things from Palestine. So back to my variation of the spiced lamb recipe, which is lamb spiced with Nine Spice Mix and then fried with garlic, green chillies, tomatoes and salt. The Nine Spice Mix is made by grinding whole versions of 9 different spices – hence the name. I mostly had pre-ground versions of these spices so I used these to make it up. It worked out great. I do want to try to make it right. I have a little spice blender – which I’ve mostly used to grind coffee beans. But I’ll need to use up the ground versions of these spices first. I want to try and make the spice mix the correct way but I’ll have to use up all these spices first. Apparently the spiced lamb in tomato sauce is a dish that is had for breakfast or supper – it can be made without the lamb so it’s just a thick spicy tomato sauce to have with bread or rice. I think you could leave the lamb out of my version too – and maybe add in some chickpeas. I might try this because I want some more vegan dinner recipes – will post if it’s good. Both the original and this version are definitely dinner dishes for me – they’re very substantial. I used tinned tomatoes, rather than the fleshy fresh tomatoes recommended in the recipe, so I added in a little spoon of sugar as tinned tomatoes are much less sweet than fresh ones. Lamb, aubergine, green bell pepper, garlic, tinned tomatoes, spices, sugar and salt. Combine all the spices together. Turn on the oven to 180 C.
Heat oil in a casserole or oven friendly pan over a medium-high heat until hot but not smoking. Add the meat to the pan and sprinkle with the spices. Cook for a few minutes, stirring around occassionally to avoid meat sticking to the pan. When there is no trace of pink on the meat and they have released some of their juices, add in the diced aubergine and green pepper. Keep stirring around and cook for another few minutes until the veg has softened a little. Add in the garlic and stirr regularly for a minute or two until fragrant. Add the tomatoes and break them up with a spoon. Add in a pinch of sugar and the teaspoon of salt. Bring to the boil, then reduce the heat, cover and transfer to the oven for 60 minutes. Take out of the oven, uncover and give the stew a stir. Let it cool for 10 minutes so you'll taste all the flavour better. Taste and add a little more salt or sugar as necessary. Serve with either rice or bread. Enjoy! When it’s done, taste and add a little more salt or sugar as necessary. Some Levantine lamb stew with a little rice. Where the Line Is Drawn review – can a friendship survive the occupation of Palestine?